Seeing how last week in this Harpin Points post I complained about teams that went for drop goals when they should be going for a try, it's only natural that the rugby gods would make sure that the following weekend would see a high profile match where the exact opposite happens. Forget about the two teams for a moment, and just focus on the fact that it was a tier one test match, in decent playing conditions. You have an attacking scrum in front of the posts 5m from the try line. You trail by two points. As the two packs come together, the clock is going red. Why wouldn't you have your drop goal specialist go into the pocket to set up what should be a relatively easy three points to win the game? I have heard some people say that Beauden Barrett didn't fancy it because not only was he yet to score a test drop goal, as the All Blacks were fighting back with two tries in the closing stages, he had hit both conversions off the uprights. They also said that the Springboks being down to 14 men was a reasonable factor in the decision. Well the purpose of these posts is for me to give my opinion, so here it is. It wasn't strategy, it wasn't common sense taking previous kicks into account, it wasn't anything but sheer boneheaded arrogance IMO. "We're the All Blacks and we didn't get to be number one in the world for a gazillion years by winning matches with mere drop goals. We want all seven points every time we have the ball and by God, we're going to have them." Only this time, they didn't, thanks to an epic goal-line stand by Rassie Erasmus' shorthanded team that endured an energy-sapping 17 phases after the 80 minute mark and included quality stops from their smallest players Cheslin Kobe and Faf de Klerk right at the start of the sequence when the biggest crash-ball stops were to be made. Fair play to them for that, plus of course getting themselves into the lead in the first place, hands down the best test match of the calendar year so far (once I take off the green goggles from the Six Nations of course!). Let's not forget the Pumas who had a decent away win of their own on the same day...wouldn't have minded having a few quid on THAT double! And speaking of Ireland, when it comes to our impending clash with the ABs in November, we can look at it two ways...(1) "Ah no they're going to take out their anger on us", or (2) "Excellent! This means they're definitely beatable and we've every chance to get a second win." Maybe it's also arrogance but I'm still going for option 2. Watched Wasps v Leicester last weekend and once again high tackles were being called into question. The Tigers' Will Spencer was sent off for a challenge on Tommy Taylor. All of those opinions make sense, to a point. And that point is the borderline between the game of rugby union and the real world - because for some issues, we have to be willing to cross it to form a proper opinion, and this is definitely one of them. Sure, if we stay in the 'professional rugby bubble', those calls by officials might look harsh. Nobody is actually setting out to injure their opposition (I hope) and year after year the technique is getting better. But there's one important aspect we have to remember about the top games of rugby...among the millions watching are players who have their own lower level matches every weekend as well, with a lot of those being schoolkids. The technique doesn't tend to be quite so proficient down the park of a Sunday morning, yet if they see the pros going high for their tackles, it's only natural to have a go themselves. And the decision to be supposedly 'zero tolerance' for high tackles wasn't plucked out of thin air; it was the result of extensive research being done into the causes of injuries, including concussion, at all levels. So what that leaves us with is two sides of a debate, one where there are rugby defensive coaches concerned about their players not being able to tackle in such a way as to prevent an offload or steal possession, and the other with medical professionals concerned about people getting seriously hurt. No contest for me, and the opinion from respected people within the sport should follow a similar line. 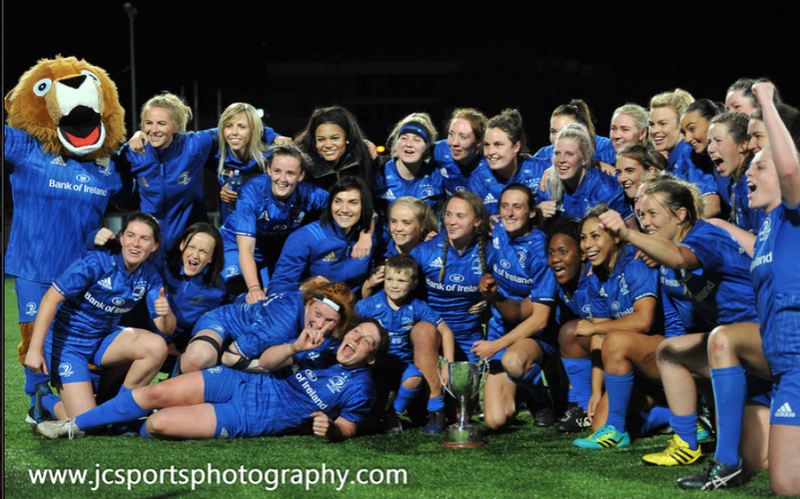 Congrats to coach Ben Armstrong, captain Sene Naoupu and all the Leinster Women for their interpro title won at Energia Park on Saturday! Sounds like it was quite the nailbiter against Munster; it finished 14-14 which means we won on points differential and the visitors had a last-gasp conversion chance to win go wide. I would love to have gone but with the men's home opener the same day, it suited my schedule more for my second match to be the A team's Celtic Cup clash with Cardiff at lunchtime, and I even missed a chunk of that because of a changed kickoff time. To be fair to Leinster Rugby they did what they could to tempt fans down to watch offering admission to those showing their ticket from the RDS, but still, three matches in one day is a lot to ask, and I dare say many would have gone to all three had they been more spread out. A couple more thoughts on the Women's Interpros in general...is a three-week round robin format enough at this stage? Could they go to a full home and away schedule? I'm genuinely asking, maybe it's not possible because of travel and the players' amateur status and what-not, but I'd say the national coaching set up wouldn't mind a few extra looks at their players at this level ahead of the Six Nations. Plus...could this have been on the telly? 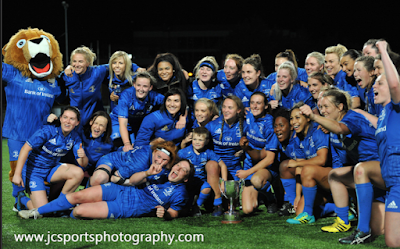 This Interpro decider in particular is the highest level match played in Ireland outside of test matches, and showing matches like these could help determine if there's an appetite for some kind of Heineken Cup equivalent for women, which I think there is. For now though, we're always happy here in Harpin Manor to see Leinster success and that is certainly a welcome addition to the trophy cabinet. "The new 'Night Navy' adidas Leinster Rugby European jersey has been launched and is now available from Life Style Sports, exclusive retail partner of Leinster Rugby. 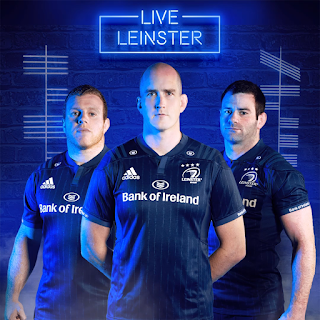 The third and final adidas jersey to be added to the 2018/19 Leinster Rugby range again references the history of the province and the twelve counties. To celebrate the army of fans that will support the boys in blue as they journey across Europe defending their Champions Cup title, the name of each of the twelve counties in Leinster is visible on the jersey using the ancient Irish alphabet ogham. A fourth star sits proudly above the Leinster Rugby crest on the jersey which is now available to purchase exclusively in Life Style Sports stores and online. Replica jerseys are priced €75 and Kids jerseys are priced €55-€65." I have stated before in this column that there is always at least some moaning about a new jersey. Without fail. And I know there are Victor Meldrew wannabes no matter what the topic, but this one tends to bring them out even more. Among the complaints surrounding this new offering are the logos supposedly looking 'stuck on' and the stars over the crest not being centered. Well I don't know about the stuck on thing but I will say this about the stars...to me, it is pretty obvious that they have left room for a fifth one. While that borders on the arrogance of which I spoke in an earlier Harpin Point, since we're talking about the design of a jersey rather than the winning of a match, I reckon that's a decent way of showing your fans you have ambitions for the future. Overall though, my first reaction to the jersey was that it looks rather plain? Yeah, I get the whole Ogham script thing and it's a nice thought, but when you add up the sum of its parts, it just looks like an all-blue jersey and doesn't come close to setting it apart from the Pro14 one the way last year's did, which in turn raises questions over whether or not the 3rd jersey is really necessary. And that's not necessarily a critique of adidas over Canterbury either, just these particular designs. As I have said before, the fact that Munster had the three stripes already for a while might skew the opinion of Leinster fans like myself so maybe we need to give it a bit of time before we properly judge. Right now though, having said I'd wait for the European one before I made a decision on which I'd buy, I think I am straying back towards the Pro14 one for now, though I'll give it a bit more time until I have seen them all 'in the flesh'...or is it fabric? When it comes to TV coverage, I'm not too concerned about who the pundits are. Showing the match at all is good enough for me. Though there are a few niggly details I would like to be set as standard, and as yet eir Sport haven't been able to provide all of them. I'm old enough to remember when the only time you'd see a scoreline graphic on the screen was when it had actually changed or at the beginning of a half. Nowadays, having both the score and the clock in the corner of the screen are expected. When it comes to rugby, some extra elements have been added, and different networks seem to have different ideas on which are necessary, so I plan to use this Harpin Point to go through the ones I think should always be present. Cards - If a yellow or red has been issued, pretty much everyone sticks a card in the score graphic above the team's name. But one additional feature that has crept into the game is a countdown clock for sinbinnings...eir Sport don't have this yet and I really think they should. Tries scored/Bonus points - I like the '1T' and '2T' alongside the team name, always good to know how many tries they have scored, but I don't like the way they make it say just 'BP' once they've four or more. I say keep the BP there when they hit 4 but have a separate space for the total try count as well. Phase counter - Crucial for modern-day rugby-watching IMO, and the count should always, always start at 5. It's a tough one to keep track of I know, but it makes for a great companion to watching the play. eir Sport are hit and miss with this one. Time elapsed - One thing that always bugs me watching Top 14 matches is when the clock stops and the director takes the time elapsed off the screen and replaces it with the word 'STOP'. Why do that? We know the clock has stopped because numbers aren't changing!!! After reading the above thoughts, if you're thinking : 'wow, this guy watches WAY too much rugby on TV', you'd probably be right. But hey, I run a rugby blog, so my high level of nerdery is already out there! And having seen a lot, I reckon I'm in a good position to judge what should and shouldn't be there in the coverage. IMO the goal of TV sport graphics is to bring anyone joining the broadcast late up to speed on the state of play as quickly as possible so while it's hardly the most important topic, it's worth having a discussion.